Kundan and meenakari works found their way to the commoner through smaller articles like jewelry and decorative objects and the replacement of precious material with accessible ones. 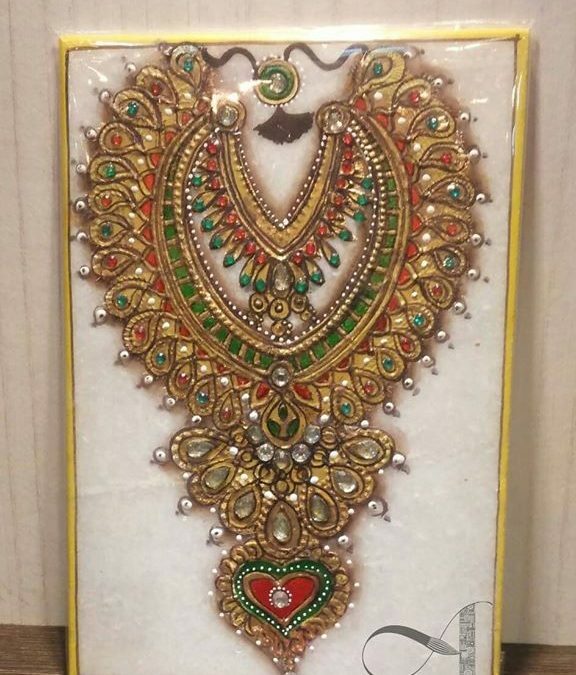 A craft that combines kundan jadai work and meenakari with marble is practiced in Rajasthan known as Meenakari gold painting. Join us to make intricate beautiful jewellery designs on marble boxes (5″ x 7″) & glass coasters (4″ x 4″). The workshop will be spread over two days where you will learn the entire process – from making of the base to finishing and preserving your artwork. Take home unique self-done fusion boxes to adore your rich and precious jewelry in them & glass coasters to enrich your table decor. Pre-registration is mandatory. Please register by paying in advance. You could pay by paytm on 9844814482 to confirm participation. For any queries, you could contact on 9844814482.